It’s hard to say how close Cincy’s current production numbers compare, because the city is home to a large Samuel Adams facility that doesn’t advertise its production numbers, but the combined efforts of the city’s incredible craft beer scene still fall well below those 1890 levels. What do you see there besides some bags games, a mounted deer head, and a foresighted artist’s depiction of our collective reaction to the deer head? What you see is living history, as Rhinegeist is housed in a former bottling plant for Christian Moerlein Brewing Company, the largest Cincinnati brewery of the 19th century. It’s part of a Moerlein brewing complex that once took up three city blocks in Cincinnati’s historic Over-The-Rhine district (a formerly German-dominated area which once housed dozens of breweries, hundreds of saloons, and tens of thousands of thirsty Zinzinnati residents) and produced nearly 300,000 barrels a year. Knowing this makes walking into Rhinegeist a pleasantly surreal experience. Head in off the street, climb a couple nondescript flights of stairs that make you wonder whether you’re in the right place, and suddenly everything opens into the cavernous space pictured above. Come at the right time and you’ll be greeted by pickup games of wiffle-ball or bags against a backdrop of giant fermentation tanks. Ask to join or sit yourself at the long, biergarten-style tables and just watch. Beats the hell out of that other brewery’s generic manufactured taproom (don’t make faces, we all know one). On the surface, this is creative use of a brewery’s excess space, which is a problem few breweries have to begin with. But if you let it, it will sink in: this place really does go on and on. 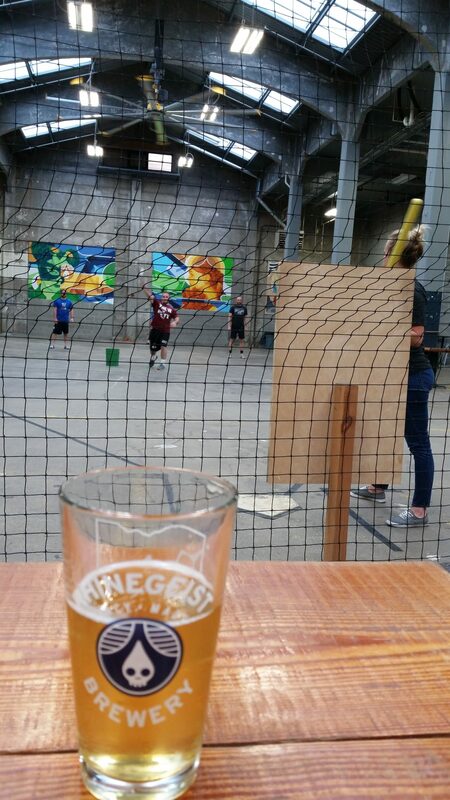 Between the two bars, the path upstairs (to yet another bar on an incredible rooftop patio), the half dozen fermentation tanks, the ample seating, and the spacious indoor wiffle ball thunderdome, this place has so much room for activities. The beer list goes on and on, too, which is great. I especially like their rotating selection of creatively-hopped pales. Pure Fury stands out, though that bomber of Mosaic Promise I picked up was also memorable. If Rhinegeist really is one of craft beer’s cathedrals, these are the pipe organs. And that’s just the main taproom. Take a (free!) tour and you’ll find this place is much, much bigger. 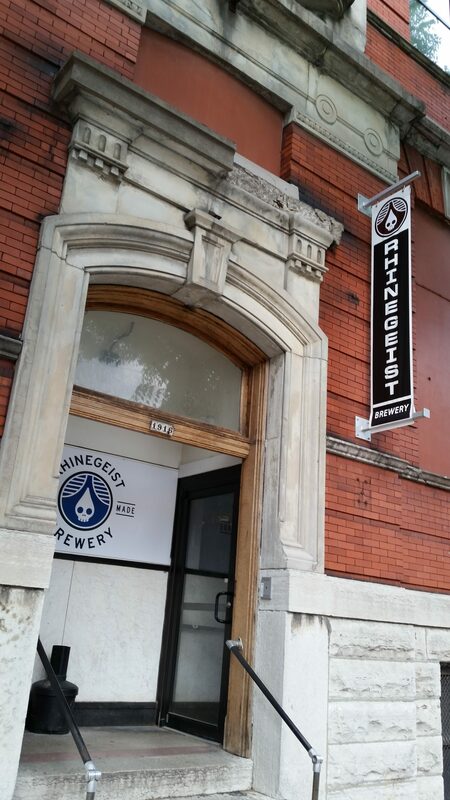 There are the two private event spaces, the office space, and the primary floor where Rhinegeist’s own brand of Truth (among others) is brewed, packaged, and stored. Mash tuns and office space. At least a dozen more fermentation tanks are out of frame to the right. Part of the roof needed to be removed to lower the tanks into position. I don’t know whether Rhinegeist intended this, but there’s a subtext here: American craft beer is great, but it has really big shoes to fill. Rhinegeist is pretty large as far as craft breweries go, producing about 30k barrels when I visited but on the cusp of an impressive expansion (Update 2/7/2017: Rhinegeist announced that in 2016 it sold over 56k barrels, or an 80% increase over the previous year). Yet despite being a major regional player on the craft scene today, they still struggle to fill the space of one single part of the brewing complex of a major regional player a hundred years ago. Craft beer today is re-inventing, not creating, the local focus and diversity that once characterized American beer. Beautiful rooftop patio. Look out in any direction and see a once bustling brewing district revitalizing itself into vibrant neighborhood. Not that Rheingeist has to be anything like the Moerleins of the 1890s. In fact, they just announced that they are rejecting overtures from Big Beer that could have made them the latest in a long line of controversial craft buyouts. But the sense of scale and growth potential one feels there is reminiscent of the phoenix-like rebirth that American beer is experiencing. It’s not just measured in barrels produced and sold, though that is part of it, but also in less precise areas like diversity, inclusivity, competitiveness, and entrepreneurship. Did I just name several things that are so vague I can define them however I want? Sure I did, but they’re still important and worth thinking about. Those things defined the Moerlein brewing complex, born of German immigrants whose beer and very presence were not immediately accepted in the U.S., and forged in a transforming and ruthlessly competitive economic climate, as were thousands of American breweries of the 19th century. The same things define craft beer today, whose recent past has juxtaposed ever-increasing demand with volatile or outdated alcohol regulations, complex distribution systems, and stiff competition from the largest beer firms ever to exist on the planet. It faces legitimate questions of inclusivity in its participants while the beer itself has become more diverse than at any point in history. So I challenge you to grab your sagely pint of Truth and give Rhinegeist some thought. Think about their maverick but well-financed origins, their business conduct, and their apparently independent future within this outer Moerlein shell. It’s worth your while to consider the many paths that a craft brewery can take in defining and pursuing its own success. Think about how breweries choose and use their space. Its importance goes far beyond simple aesthetics or branding or efficiency. It’s a statement about who they are and how they see themselves within the vast legacy and future of American beer. Finally, think about how the biggest locally-owned (sorry, Sam Adams) craft brewery in Cincinnati hasn’t come close to outgrowing the monument to beer history that it happens to call home. It will remind you that craft beer still has lots of breathing room, and the ceiling is so far above us that it might as well be the sky. And while you’re at it, think about how many craft breweries operate in the shadows of breweries long past, and at times within their hollowed and hallowed skeletons. I doubt the new boss will be the same as the old boss. But whether they’re high heels, wingtips, or work boots, craft beer has some big shoes to fill. And Rhinegeist won’t let me forget it. Previous postInterview with Timely Tipple!